2016 is closing with an outpouring of goodwill from CMIRC members and friends of the club. Our first members meeting of December featured guitar maker Frank Muller, whose presentation on classical, folk, and electric guitar making enthralled us in our near-capacity meeting room at Hong Kong Lucky Restaurant on Dec. 6th. In addition to an assortment of guitars, including a rare eight-stringed acoustic beauty, Frank exhibited the various parts, pieces, and tools needed to create the instruments. Thanks goes out to Colin Jarvis for introducing Frank's talents to CMIRC. 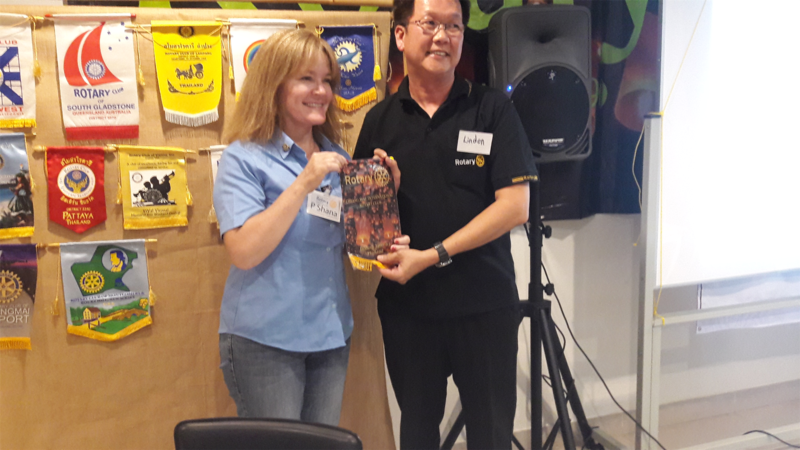 Along with our guest speaker, we also had two visiting Rotarians from the Philippines, Lindon See Diet and Chris Mah; prospective new CMIRC member Bill Kip; and returning guests Mary and Steve Hambley from Australia. In service projects news, Water Safety Program champion John Schorr announced that more than 300 Chiang Mai kids from eight schools have completed the 15- hour drown proofing course, with three more classes scheduled for spring, 2017 (where does the time go?) Also, Cindy Johnson, who teaches at Asia Pacific International School, asked project champions if they'd be available to talk to her business students around January 16-20, 2017. More details to follow. Finally, in Happy Baht News, Maliwan Kaew-Amphai was glad to have visited Hanoi, but sad to have been hit by a motorbike, Frank Muller was relieved to have recovered from his own motorbike accident (which prevented him from visiting the club earlier in the year), Raelene and David Haines were looking forward to hosting their daughter for a couple of weeks, and sergeant-at-arms Bill Mason was sporting a new wedding ring - congratulations! 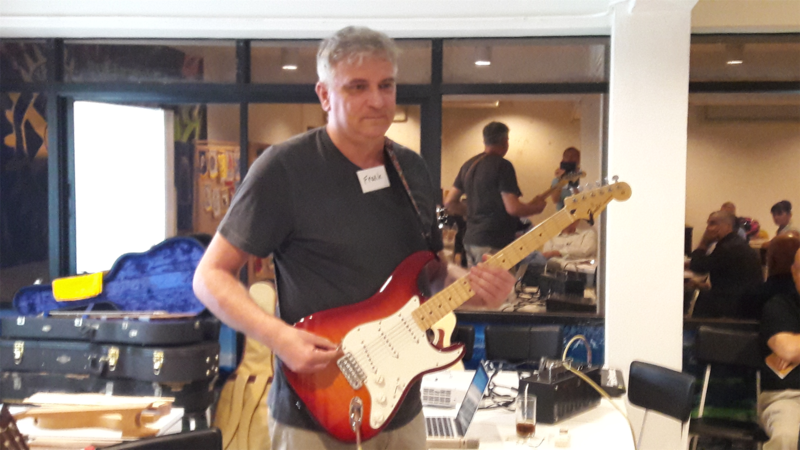 Frank Muller had feet tapping as he demonstrated the opening chords of Dire Straits' "Sultans of Swing" on a classic Fender Stratocaster electric guitar. DG Lindon See Diet from the Rotary Club of Dipolog in the Philippines exchanged banners with CMIRC president Shana Kongmun. The Children's Water Safety Project teaches non-swimmers how to survive, and by the end of the 15 hour course, thrive in the water. 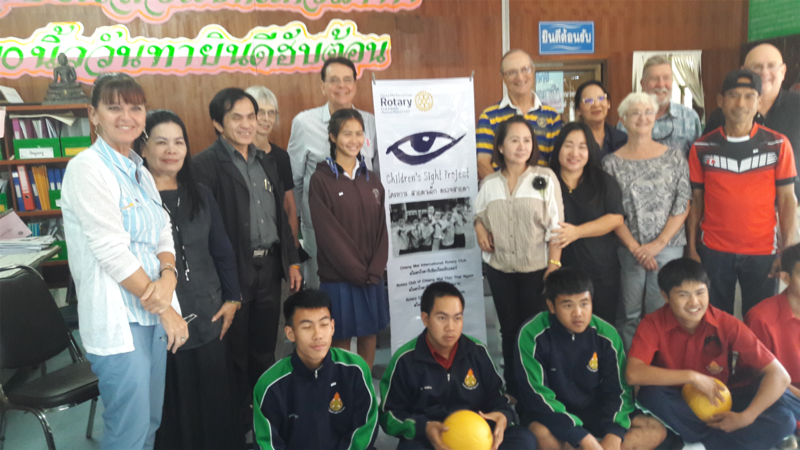 CMIRC Children's Sight Project members returned to the first school we visited in Mae Taeng almost a year ago (looks like the photographer needs his vision checked). Imelda Tibbott contemplates defeat yet again as darts soar in the background at the Ban K. Kee Patient House. CMIRC supports the house with donations of food, clothing, money for repairs, and, most importantly, members time with the kids. However, Ban K. Kee House founder Kanchana Thornton has asked us to limit the number of members visiting to four, and maybe five tops, unless there's a special occasion. Too many outsiders overwhelm the staff and patients. Contact project champions Karl & Jeannie Wells if you are interested in visiting. CMIRC must pay all member dues at the beginning of each year, whether the members have paid or not. So if we don't pay our dues, our projects suffer. Please see treasurer John Schorr at Tueday's meeting if you haven't paid yet. The club has a chance to "create some wealth" Feb. 4th at the JJ Market flea sale, so members are encouraged to start gathering saleable items for this fun event. 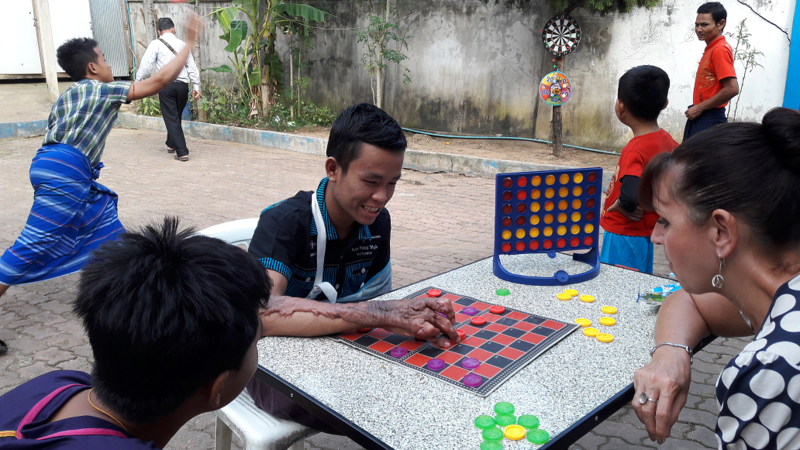 CMIRC netted nearly 14,000 baht last year, which all went to support our projects. With the cancellation of the hot air balloon festival fundraiser this year, we need to find income from other sources in 2017!